Cannonball Events | Be the best runner you can be ! 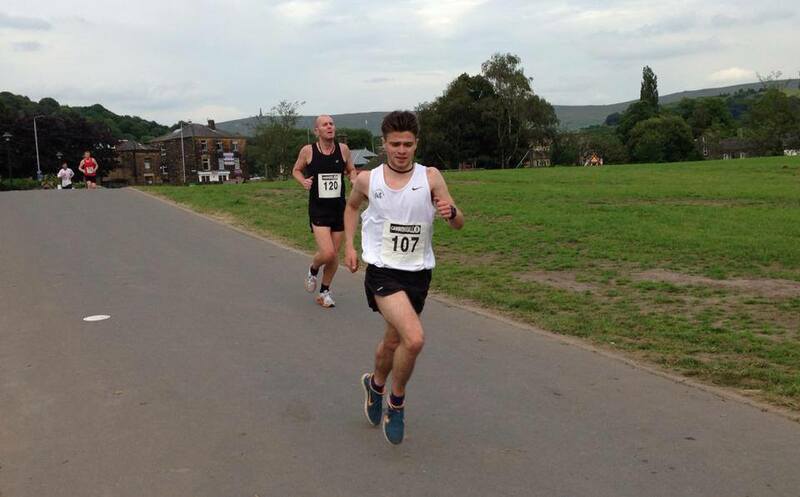 Tom Collinge was once again in fine form at the final Todmorden park 5k race of the Summer series, taking victory in an impressive 16:54. 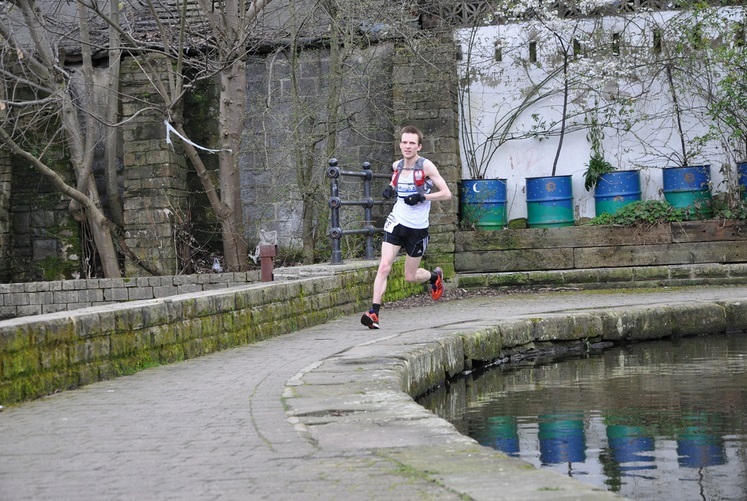 This keeping in line with previous consistent times (16:40 & 17:05) also managed to land him the overall win for the series with a total qualifying time of 50:39 ahead of some pretty stern competition from Dave Potter (Trawden Ac) in second place & Burnley Ac’s Daniel Balshaw in third. Over to the Ladies race and week four saw a new course record!! Uk Netrunner Hannah Oldroyd cruised to victory over the five laps with a storming run of 18:14. The battle for the series in the ladies had been one of epic proportions with two runners literally ‘going at it’ in each and every race of the series with some great times along the way. In the end, Salford Harrier Annabeth Orton narrowly edged out Autumn Howard of Trawden Ac by only 27 seconds over the combined times with both ladies three best times being under 20 minutes – what a cracking effort! 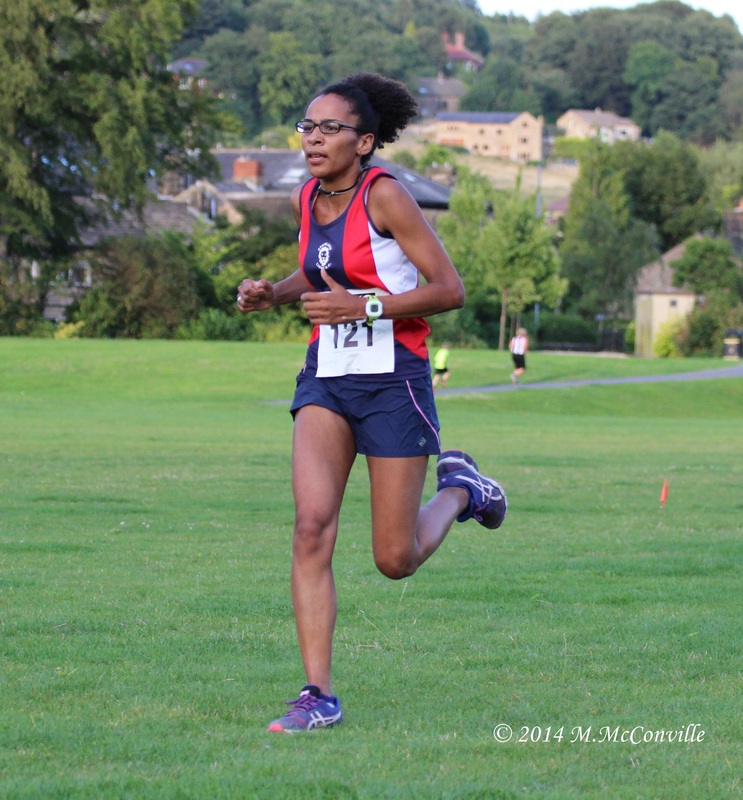 There is also a mention to third placed runner Natalya Irvine of Blackburn Harriers who is an under 18 runner, certainly one to look out for in the future. One of the main ethos of Cannonball events is the fact we pride ourselves that our races are for everyone, not just the faster runners and each time we hold a race series we award prizes for runners who show improvement to their times over the races. 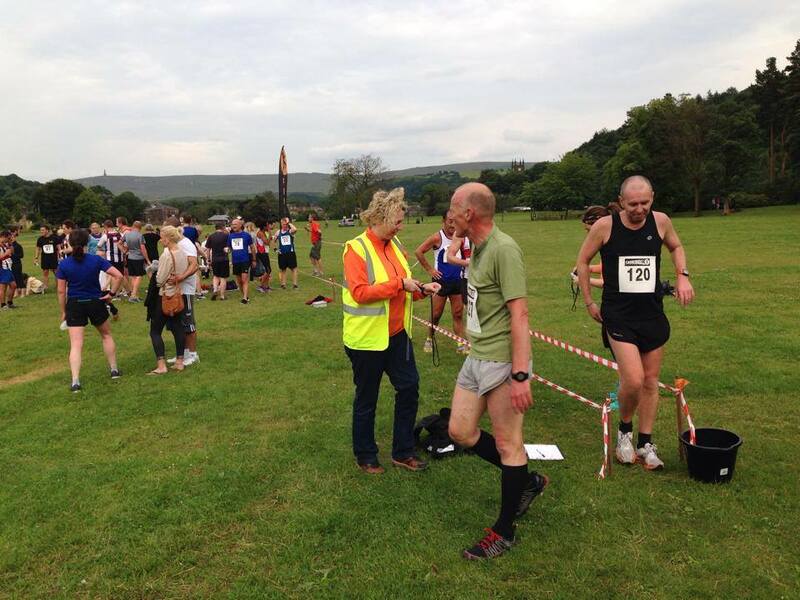 42 runners qualified as eligible by showing improvement on their base time from week one and the most improved tag was thoroughly deserved by David Howard of Trawden AC with a really impressive 11.8% improvement in time from 24:31 to 21:38 which is amazing in just a few short weeks. The most improved female was Alison Butterworth (U/A) with a 10.9% slash to her time from 37:03 to 33:01 – over 4 minutes dropped. Overall we hope you have been as happy with the series as we have. We have seen both male & female course records smashed – who knows just how low they may go next year. We have seen a record turnout for race 2 which we were grateful to the Pendle & Burnley GP for including it on their series this year. The new finish to the course seemed to be well received with good feedback from runners. 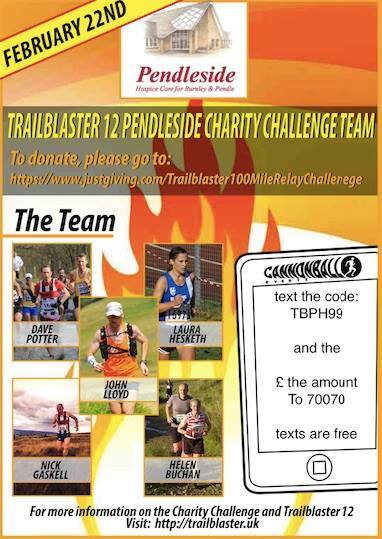 As usual, these races could not happen without such phenominal support from the runners & good turnouts from many of the local running clubs, there will be extra incentive for runners if their club chooses any of our races to be included on their GP/Club Championship for 2015 – E-mail john@cannonballevents.co.uk for details. Thank-you to all our sponsors, GW Fitness & Rehab, Sportshoes.com & Serious Supplements for the continued support and belief in what we are trying to achieve. Also thanks to Lynne Ainsworth & Mark McConville for the use of pictures taken at the races for publicity purposes. So that’s a wrap for the summer series of 2014, it’s definitely been our best yet, don’t worry though it’ll soon be winter and you get to do it all again! I’ll leave you with one final picture taken of Improver winner David Howard at race 4, this, for me, sums up what it should all be about! With so much that has happened it seems quite hard to believe that 12 months has passed & we are once again underway in another 5K race series in Todmorden park. The usual 4 race format has once again been adopted with prizes awarded for series overall winners and prizes for the runners with the most improved times over the series, with 3 races needed to count. After listening to your feedback we decided to slightly tweak the course to give 5 equal laps of 0.96 km with a final straight blast into the centre of the park which not only creates a better finish funnel area but also keeps the race route free from runners impeding people who have not yet finished. 74 runners headed for the start line in race 1, which took place last Thursday 26th June. A significant increase on the 47 that ran the fledgling event last year! It was good to see faces a plenty both old and new with a good uptake of people opting to enter the complete series of 4 races. We advertise these race as ‘Fast & Flat’ & ‘A Good PB Course’ and this race was no exception to the rule with 8 runners coming home in under 17 minutes and a new course record time of 15:50 taking the win for Nathaniel Williams – An unattached runner! 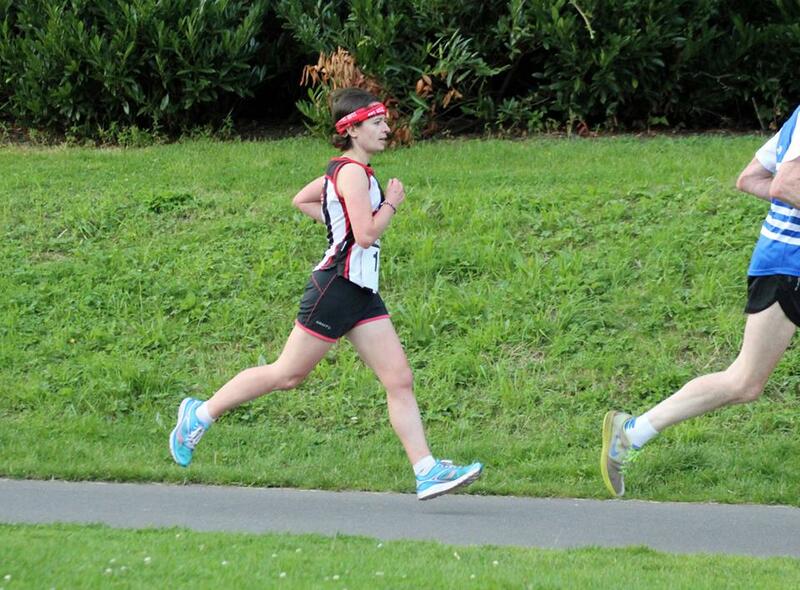 There was a good battle for second between Max Wharton (16:15) of Halifax Harriers and Alex Whittem (16:19) of CVFR. Onto the ladies and Cannonball regular Laura Hesketh of Blackburn Harriers romped home in 19:14 to take the honours ahead of Autumn Howard (19:52) who won the finish straight battle of the bloggers and forced Salford Harrier Annabeth Orton (19:54) into third place. It was great to hear lots of talk of ‘seasons best’ and ‘PB’s’ around the finish area and also the genuine sense of running community with so many runners waiting back for the tail enders to finish their runs before heading over to the Hare & Hounds for prizegiving. The next race on Thursday July 10th is also incorporated into the Burnley & Pendle GP and as a result we are expecting a larger than usual field to be competing. With this in mind we are upgrading our usual timing method for this race & will be using timing mats which will be able to record each runners lap splits. Pre entry is advisable as we expect to be busy & this will help us massively with number issuing etc…. 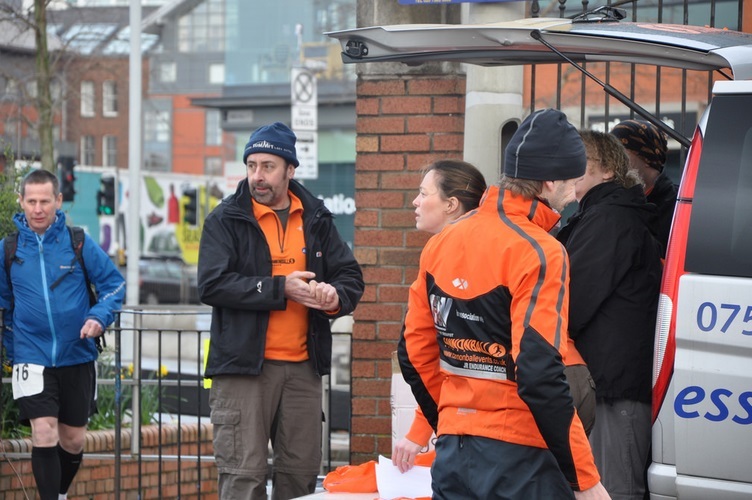 As always, a massive thankyou to all the help on the day – we even have people who help us out with registration & results who manage to run the races as well! Now that a few days has passed and the dust has settled on what was an amazing day for us at the Inaugural Canalathon Ultra event here is an exclusive insight for those that maybe weren’t fortunate enough to be there to see what they missed and what to expect next year – when we hope the event will flourish into something bigger and better. 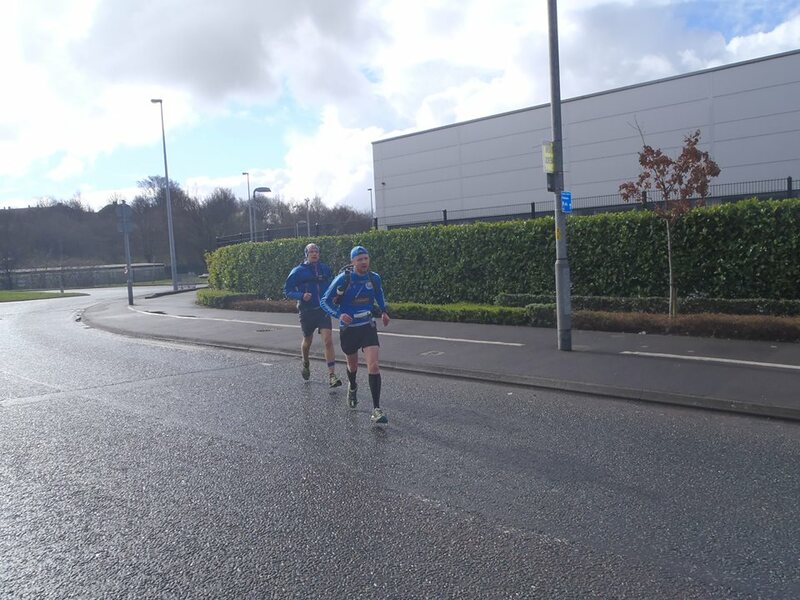 it was amazing right from the off to see an almost instant sense of community to the event as the sheer enthusiasm from runners, supporters & marshals alike at being part of something new was all too evident. The diversity of the field was also in evidence with record chasers & challenge runners in equal measures throughout the field which should make for a nice consistent flow of runners throughout the course. Right from the off pre-race favourite Marcus Scotney hit the head of the field and looked to force a hard pace, although other frontrunners Nick Wolverson & Franco Pardini would hope to have a major say in the final reckoning. It was however Scotney who brought it home in an amazing 3:28 which is a good bar to set if anyone is to lay claim to the course record in future years. 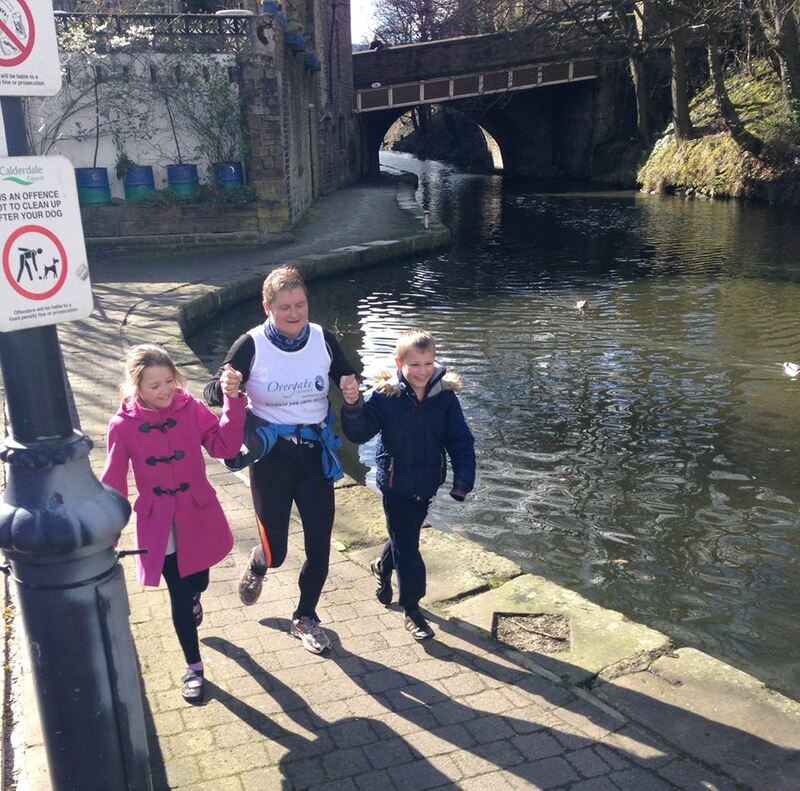 It is worth noting that he went through the marathon distance in an impressive 2h 48mins. 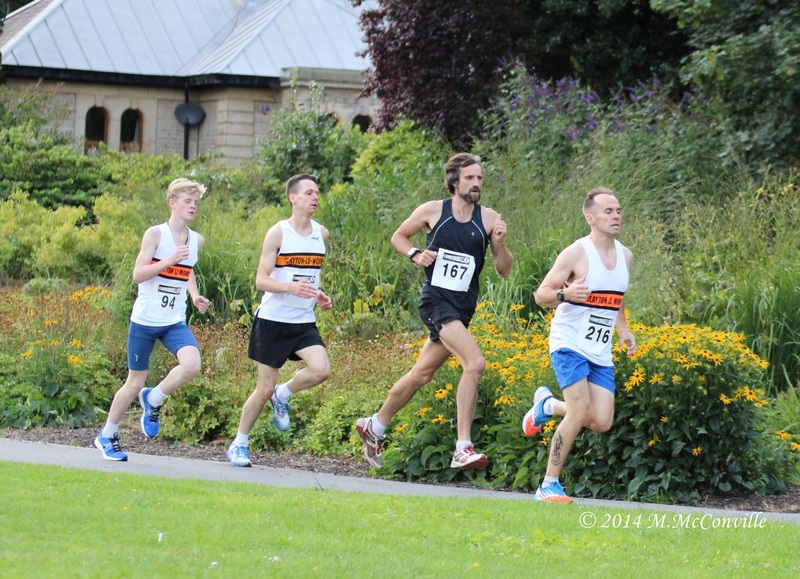 Nick Wolverson of Edinburgh AC was close second & Franco Pardini completed the podium. 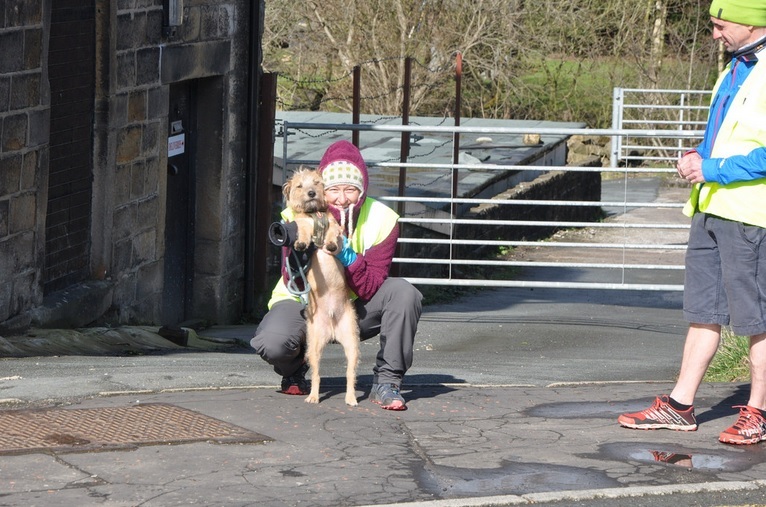 In the womens race the ever impressive Amy Green of Keighley & Craven AC came home first in a fantastic time of 4h 6mins to win by over 40 minutes from her nearest rival Anne-Marie Lord of Oldham & Royton Harriers. Now, whilst every race has a competitive edge at the business end as reported above, we are extremely honoured that people choose our events as a tool for a variety of personal challenges and goals and two notable examples of this were evident at the Canalathon. 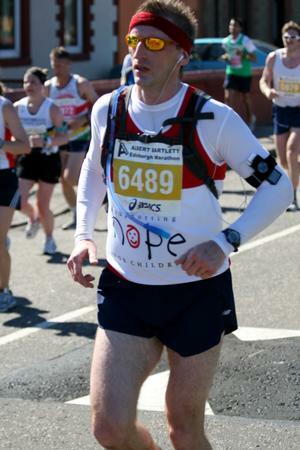 After his epic 18 marathons in 18 days in the summer of 2013, Ribchester Runners Dave Moretta had a new target in his sights – he wanted to be a world record breaker! He had his sights on a record he could achieve whilst incorporating his love of running, whilst once again showing his ultimate respect to the servicemen and women who serve our country. 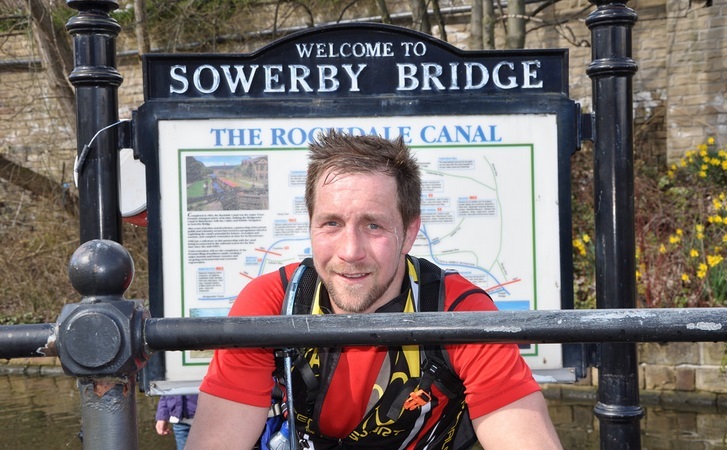 He decided he would attempt to break the record time of 6 hours to carry a 20lb pack over a 50km distance – the distance of the Canalathon. He would not be able to remove the pack until he crossed the line & would also have to be self sufficient for the race like the other competitors. His hydration and nutrition strategy would be key to his success & serious supplements were on hand as always to assist. Barring a couple of issues with his camera batteries (the entire run had to be seamlessly filmed as evidence) he achieved his goal in 5h 50mins and subject to the paperwork will be making his way into the record books. 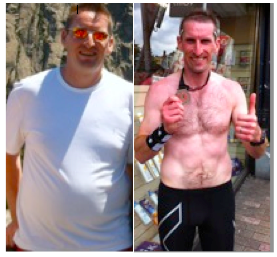 We are extremely proud of Dave for once again showing great strength and self belief to succeed and also that he chose one of our events as the platform to achieve. 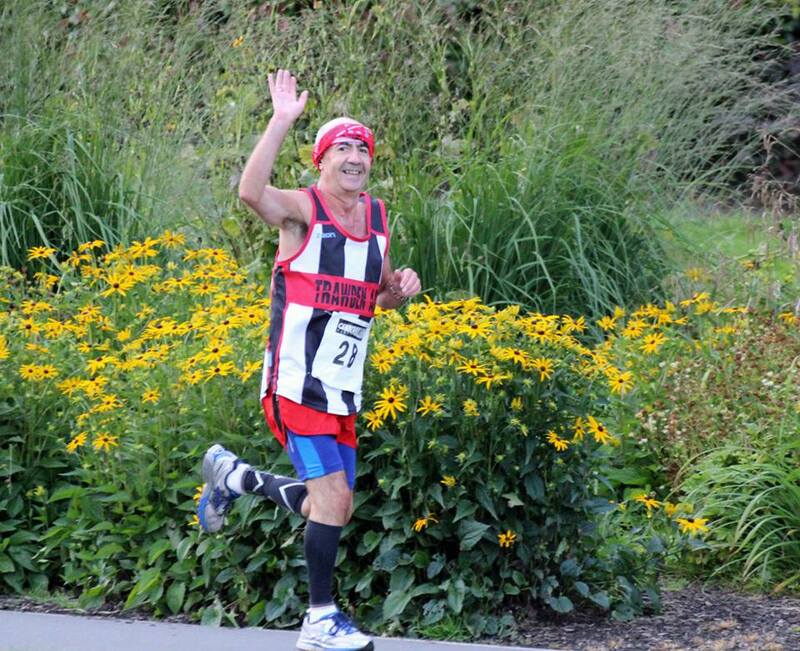 I’m sure every single runner has their own personal story to tell, first ultras, PB’s, overcoming adversity etc…. But we certainly saved the best until last. 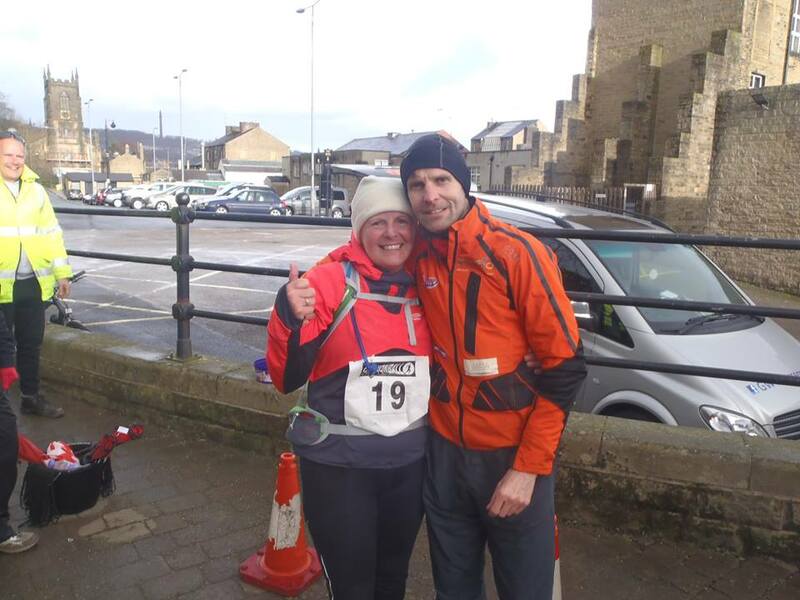 Pauline Byers, an everyday wife, friend & mother with a love of running was undergoing treatment for a second diagnosis cancer this time last year, through amazing support from a whole network of people and an unbelievable determination to achieve, completed the ultra-distance. Not happy only to achieve her own personal goal, on the day she was willing to go that extra mile and ran, encouraged and refused to leave a fellow competitor behind – it was so fitting that they crossed the line together! This could not have been possible had she not had an amazing team of people behind her and had the tenacity to put in hours of training. Pauline has been working with GW Fitnessandrehab on a one to one basis and has ventured regularly out of her comfort zone. The hard work paid off, there wasn’t a single dry eye at the finish line as this remarkable story came to it’s conclusion. It was such a priviledge to be part of that moment. i will leave you with the thoughts of some of the competitors received via our social media channels following the event and look forward to seeing you next year! francojpardini – @cannonballevent fantastic event today, thanks! 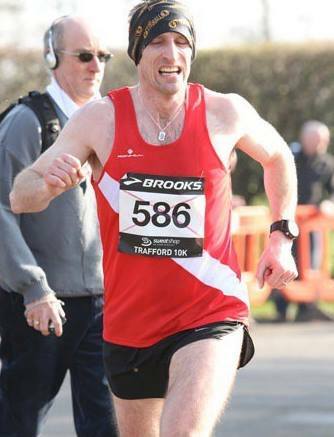 Paul Bromley – Cracking race! Thanks you all marshalls, you were amazing! Super camaraderie with other runners. 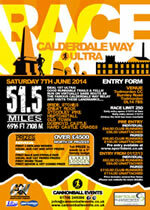 Calderdale Way Ultra next! haiggy37 – @cannonballevent thanks for organising the @Canalathon . 1st ultra ,excellent event! This Sunday sees the inaugural running of the Cannonball Windy Hill Fell race. The purpose of this document is to outline a few pointers for the day to make the race as enjoyable as possible for everyone involved. At the time of writing (Thurs 13th Feb) Online places are still available for entry and will remain open until 4pm on Friday the 14th – so if you’re not already entered now is the time to stop thinking and get involved! Registration will be open from 10am & there are 100 parking spaces at the venue. Additional parking for latecomers can be found on the national trust carparks off Rakewood Rd which are just a short walk/jog to HQ. The first & most prominent point we would like to make is that of Kit. It is the requirement of any runner taking part in this race to bring & carry the full recommended kit as outlined in the FRA safety guidelines. 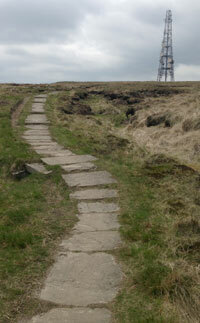 The route whilst well marked on good trails is ran over exposed moorland and conditions can be changeable. Random kit checks will be carried out at registration & also out on the course – any competitor found to not have the correct kit will be disqualified. Remember NO KIT = NO RUN! A map of the race route is available to download at our website HERE and we strongly recommend keeping it in an A4 punched pocket or similar to keep it dry. Serious Supplements have once again provided us with serious stamina to fuel you up pre race and ensure proper hydration before you race. There will also be post race refreshments available at the Rugby club. There will as usual be an extensive prize table on offer with lots of prizes in all categories & spot prizes on the day! We will again be using our own chip timing system for accurate results. Hope you have an enjoyable & Safe race! 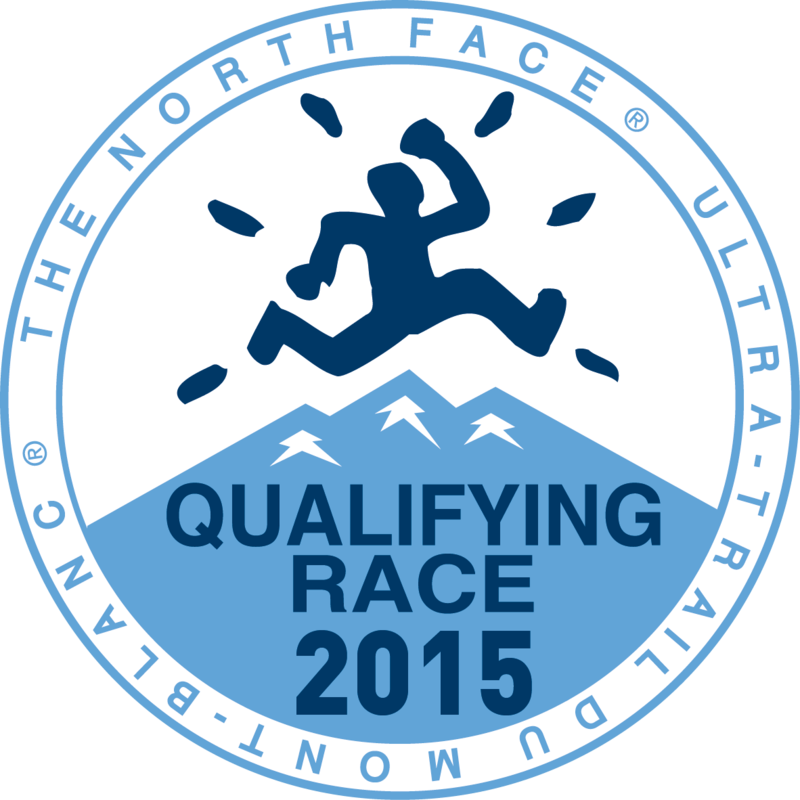 We are absolutely delighted to be able to announce that our Calderdale Way Ultra this year has been awarded 2 Qualifying point status for 2015’s North Face Ultra Trail du Mont Blanc. This now seals the quality of the type of events we at Cannonball are striving to bring to you. With competitors needing 7 points for the UTMB it shows that the planning, organisation & overall challenge of this events is up there with the best. 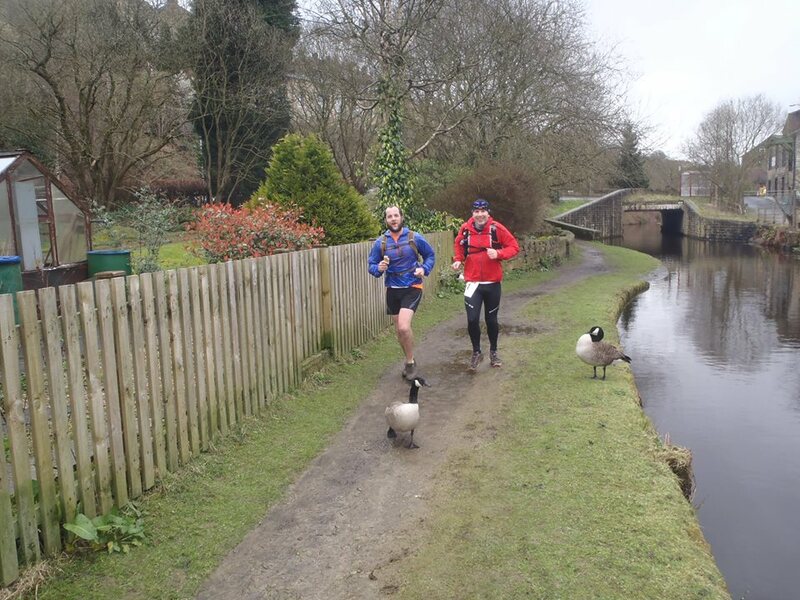 The Calderdale Way Ultramarathon is a 51.5 miles/82.88km circular around the peaks, valleys & picturesque landmarks of West Yorkshire. There is an epic 6916 ft/2108 metres of ascent (dependent on individual route choice) which is enough to challenge the very best of runners. The race is fully UKA insured and gratified. There will be a strict race limit of 250 runners and entries are currently open online. The current earlybird entry price option closes on February 1st 2014 so book now to avoid disappointment. Detailed waterproof map with descriptions of the route. Aid stations every 10 miles, with medical aid and food and drink supplies. Food and drinks fuel supplied by Serious Supplements. Outdoor Angels offering mobile aid /race support. SPORTident SI-card for recording arrival at checkpoints and timing. 2 free drinks at the bar. Hot & cold food after the race. Post Presentation Evening entertainment, courtesy of Local musician Simon Anderton performing a vast array of cover songs from different genres. *All prices reflect the professional nature of the event, this is a UTMB qualifying event so the standards will be the very highest. 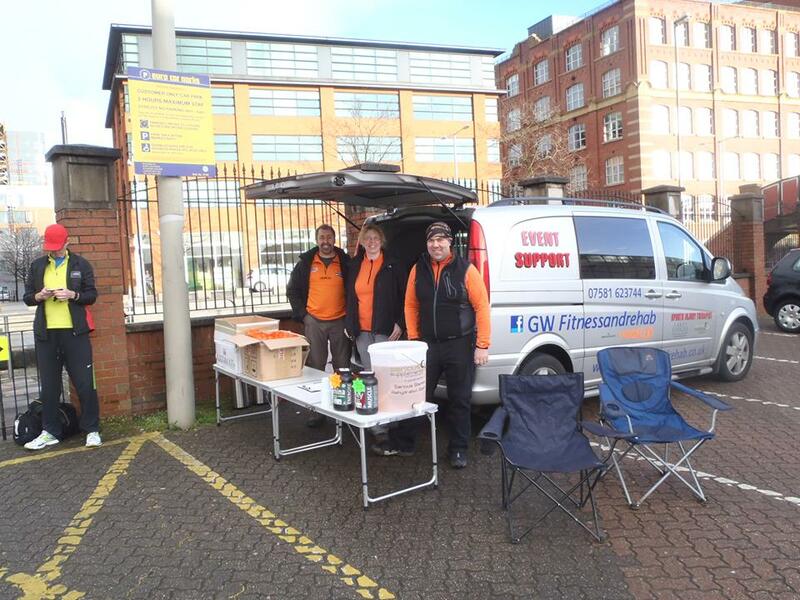 The health and safety precautions taken and the additional planning and preparation that running an event backed by UKA needs. £ 110 UKA/FRA affiliated runners. To help with your preparation for the event our support network is second to none with experts on hand in all fields of endurance sport. The team at Serious Supplements will be more than happy to assist you in developing your race nutrition strategy, their products are top drawer & we are happy that they will be providing the on route re-fuelling stations on the day. – Principal lecturer of Sports Science at Brighton University specialising in sports performance analysis. 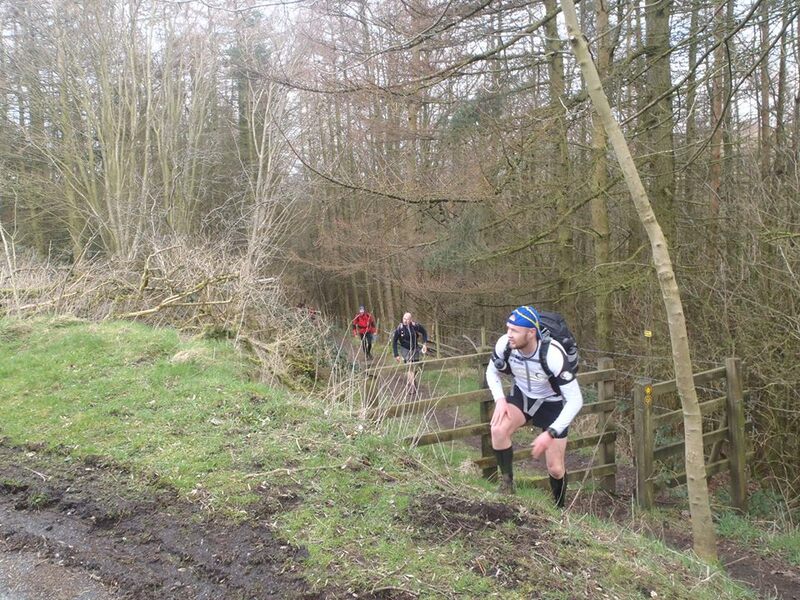 – Winner of over 11 Ultras, including winning Lakeland 100 twice. – Winner of 19 Trail Marathons. – Represented GB in The 2011 International Association of Ultra Runners World Ultra Trail Championships, finishing an impressive 15th. 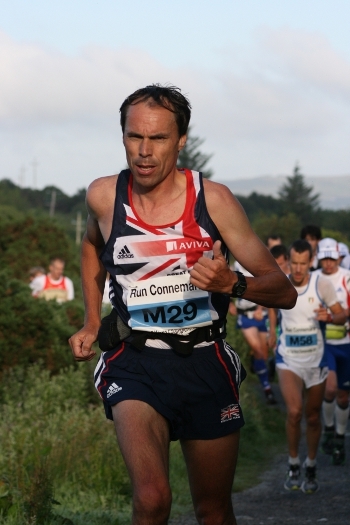 – One of the highest placed GB runners in history to compete in Ultra Trail du-Mont Blanc. Stuart will be offering all the advice/experience you could need to complete the challenge. 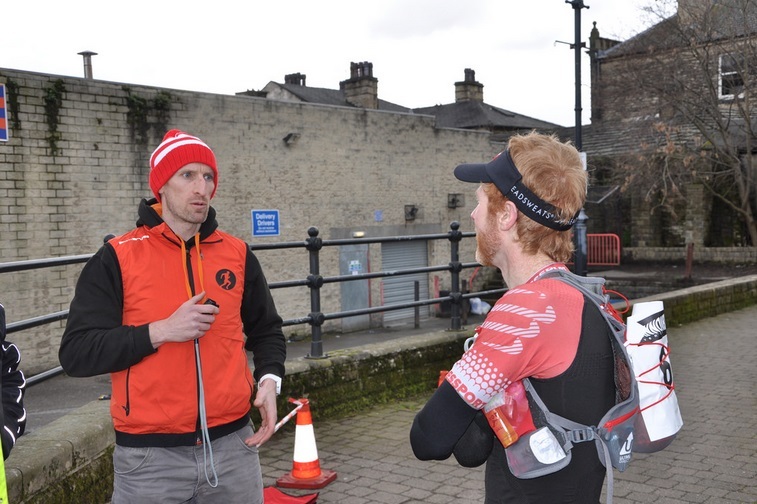 The main event is the evening Q & A session with a talk, feedback session, supper & licensed bar facility although Stuart himself wants to run a section of the route & will be leading an optional 22 mile run on the Calderdale Way leaving Brighouse at approximately 11am. All this for a modest cost of just £15 per ticket. We wish you well with your training & look forward to seeing you on the start line in June!